Ubuntu 13.04 Raring Ringtail final beta has been released today, this being the first and only milestone for Raring. If you're not using Raring already, read on to find out what's new! Note: this is the first and only Ubuntu 13.04 beta, even though the ISO says "beta 2", however, some Ubuntu flavours already had a beta release so today it's beta 2 for Xubuntu, Lubuntu and Kubuntu for instance. again, if an application has two or more open windows, users can switch between those open windows by scrolling on the application icon in the Unity Launcher. the 32px minimum Launcher icon size limit has been removed and the launcher can now be resized to a mimimum of 8px. Besides the additions above, there's also a removal: the Unity systray whitelist has been removed, so you can no longer whitelist applications to allow them to use the notification area in Ubuntu 13.04 Raring Ringtail. However, Java and Wine applications have been hard-coded as the only software still able to use the notification area so this change only affects some old applications that don't come with AppIndicator support. And since Qt applications systray icons are automatically converted to appindicators thanks to sni-qt, this change shouldn't affect too many applications. Bluetooth Indicator - a proper indicator for Bluetooth, which has replaced the old Bluetooth indicator that was basically just a patch over the fallback gnome-bluetooth icon. The work to "make Ubuntu fit on mobile" had advantages for the desktop too and with Ubuntu 13.04 Raring Ringtail, the memory usage should be greatly reduced. For instance, some processes were changed to exit-on-idle and be restarted-on-demand rather than running all the time, there have been many optimizations and fixed memory leaks and so on. And this is just the beginning. 13 new gorgeous community wallpapers have landed in Raring. Also, with Ubuntu 13.04 Raring Ringtail, the maintenance period has been reduced from 18 months to 9 months - this change won't affect just Raring but all future non-LTS releases. And of course, there have been many other minor changes, improvements and bug fixes, too many to cover in a single post. Give Ubuntu 13.04 a try and you'll notice them for yourself. 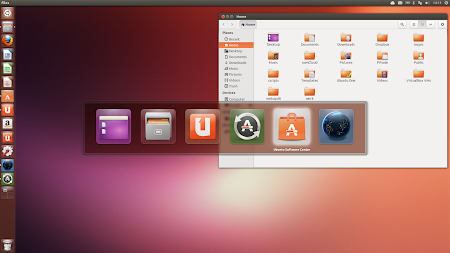 Ubuntu 13.04 will ship with GNOME 3.6 for most applications / libraries, just like Ubuntu 12.10. However, Ubuntu 12.10 was released with Nautilus 3.4, GNOME Control Center 3.4 and Totem 3.4 while Ubuntu 13.04 ships with the latest 3.6 stable versions of these applications: Nautilus 3.6.3, GNOME Control Center 3.6.3 and Totem 3.6.3. Also, Gwibber and the Gwibber lens have been removed from Ubuntu for now. It will probably be replaced with an application re-written in QML called Friends-App and the Gwibber Service will be replaced by Friends Service. This change is still pending approval. Besides the applications mentioned above, Ubuntu 13.04 Raring Ringtail beta ships by default with Firefox 19.0.2, Thunderbird 17.0.4, LibreOffice 4.0.1 (now with built-in global menu support), Ubuntu Software Center 5.6.0, Transmission 2.77, Deja Dup backup tool 26.0, Shotwell 0.14.0, Rhythmbox 2.98, Gedit 3.6.2, Brasero 3.6.1 and Empathy 3.6.4 on top of Unity 6.12 daily build as of 13.04.01 and GTK3+ 3.6.4. Raring beta uses the Ubuntu Linux Kernel 3.8.0 based on the upstream Linux Kernel 3.8.5, Xorg server 1.13.3 and Mesa 9.0.3. Ubuntu 13.04 Raring Ringtail has been very stable from the beginning and I'm not the only one saying this, many users have reported that Raring is the most stable development version of Ubuntu so far. However, this obviously depends on the hardware too, and this is stil la beta, so it's not recommended you install it on production machines! If you've installed Ubuntu 13.04 Raring Ringtail daily build and you've updated the packages through the Software Updater, you already have Raring beta so there's no need to reinstall it. This is the only Ubuntu 13.04 Raring Ringtail beta release (not counting the other Ubuntu flavours - with Raring, each flavour can have its own release schedule) and the next milestone will be the final Ubuntu 13.04 release, on April 25th.